Kitae(forging pattern) : The entire steel gives off bluish tendency. Kitae is conspicuous Itame hada generally with the indication of Mokume burl. Striking Masame straight ware appears on Shinogi-ji surface. Sparkling frosty Ji-nie is distributed or concentrates in certain areas over the Hira-ji surface and Black Gleaming Lines of Chikei layers, that comes of steel with a different, higher carbon content, appears and glows as Kin-suji thick line of Nie or Sunagashi short lines into tempered quenching area. Hamon(tempering pattern) : Hamon state is "Ko-nie-deki" that is a bit on stronger side, starts with undulating Notare with two large box shape that consists of small Gunome. Boundary line becomes tassel-shape of Choji-midare with pointed Togari-ha indication which varies in height and shape. Upper the blade it becomes lively with Soushu-technique - stronger the Nie and deeper the Nioi to form isolated temper of Tobiyaki or Yubashiri activities - flamboyant scene. Sparkling martensite particles of Nie accumulates deeply at the ends of valley where works with Tobiyaki and Kinsen activity and the interior of temper is filled with frosty sparkling Nioi with rich Sunagashi where is sparkling brightly. Boshi (tip): Almost in full of Ichimai boshi, Upper the Fukura area toward tip, it becomes stronger, wider and brighter the Nie to perceive almost Ichimai then small circle turns back to form "Jizo-style" as a side view of Jizou stone stature. Nakago(tang) : The tang is a bit SURIAGE shortened on about 1-sun (3.0cm). Two Mekugi-ana retaining holes. "Takanoha" V-shaped filemarks. Shallow Kurijiri of double bevelled heel. The entire Nakago preserves an excellent taste of patina from 16th C. The large and deeply chiseled two character KANENORI 兼法 is unique way to one of KANENORI 兼法 during Tensho period. The smith KANENORI 兼法 is said as a source origins to Mino-Senjuin tradition, who belonged to Nara-ha school during Muromachi period. KANENORI worked both in Uruma town (now Unuma, Kagamigahara, Gifu) and Seki city as well. According to Nihonto Meikan, the oldest extant work with the date of year is dated in Meiou 8 (1499) as a practical founder then ranges to Bunroku 4 (1595). There would exist at least 5 generations of active KANENORIs during it's history of 100 years. Most of extant KANENORI works are recognized from Tenbun - Tensho era (1532-91).The most major characteristic of this heroic Katana is it's extravagant shape with gorgeous pattern of temper from Soushu tradition that suit Samurai taste during Azuchi-Momoyama period. Also Inscription signature of this KANENORI during Tensho era shows a distinguishing trait from the others. 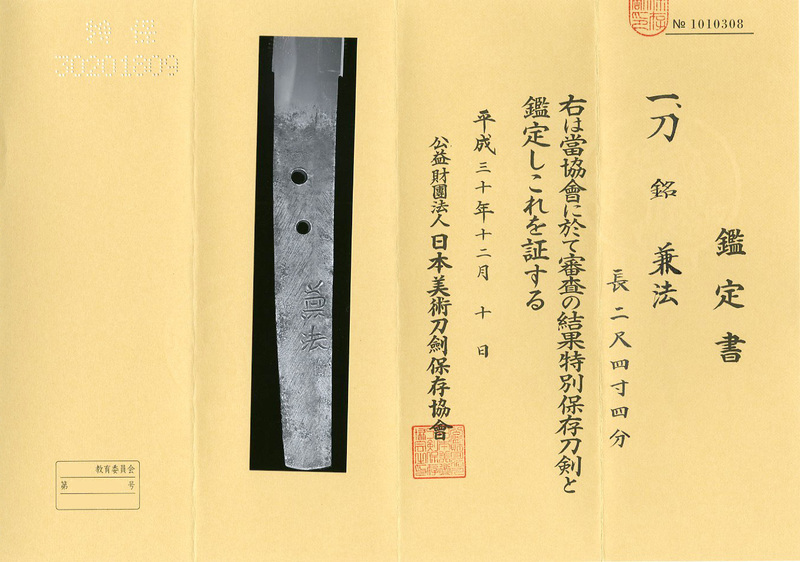 Although there is one grain opening mark in the Hakiura upper on Hiraji, this ware has been well eliminated by skilled polish, the entire blade is strikingly healthy and is very good condition for the age of 550 years. Among similar works, this blade is a delight and it's workmanship is hidden with an awe-inspiring power from the Warning States period. Gold foiled single layer Habaki collar, preserved in an Old Shira-Saya Plain wood mounting. Old good polish/Condition scale: very good (using a scale of mint-excellent-very good-good-fair-poor).